Soraya (Suheir Hammad), 28, born and raised in Brooklyn, decides to return to live in Palestine, the country her family was exiled from in 1948. On arriving in Ramallah, Soraya tries to recover her grandparent’s money, frozen in an account in Jaffa, but is refused by the bank. She meets Emad (Saleh Bakri), a young Palestinian whose ambition, contrary to hers, is to leave forever. Tired of the constraints that dictate their lives, Soraya and Emad know in order to be free, they must take things into their own hands, even it means breaking the law. In this quest for life, we follow their trail through remains of a lost Palestine. Palestinian filmmaker Annemarie Jacir has been working in independent film since 1994 and has written, directed and produced a number of short films including A post Oslo history (1998), The satellite shooters (2001) and Like twenty impossibles (2003). She works as a freelance editor and cinematographer and also teaches. Salt of this sea is her first feature film. Jacir lives in Ramallah and is currently writting a feature, When I saw you. Palestinian filmmaker Annemarie Jacir has been working in independent film since 1994 and has written, directed and produced a number of short films including A post Oslo history (1998), The satellite shooters (2001) and Like twenty impossibles (2003). She works as a freelance editor and cinematographer and also teaches. 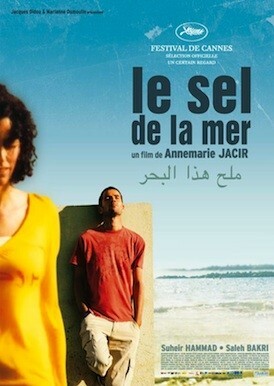 Salt of this sea is her first feature film. Jacir lives in Ramallah and is currently writting a feature, When I saw you.